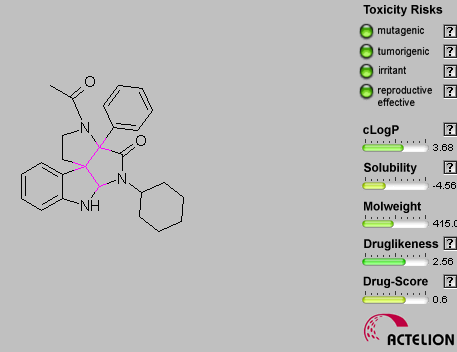 This time my review will feature two alkaloids isolated from different fungi possessing in the first case (namely Fructigenine A) growth-inhibitory activity against leukaemia cells and in the second case (namely N-acetylardeemin) inhibitory effects of MRSA. 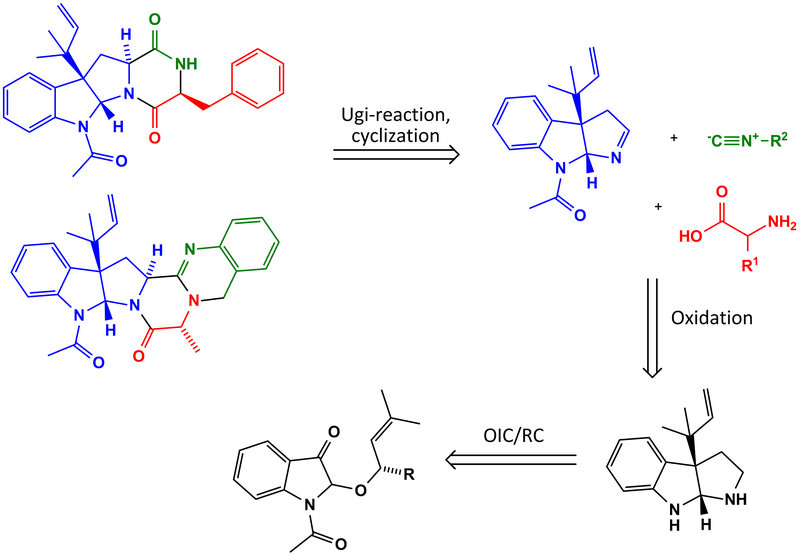 The authors planned the syntheses by employing the U3CR with a tetrahydropyrrolo-indole core as the key intermediate, an isocyanide and an amino acid to give after further manipulations both products in high yield. 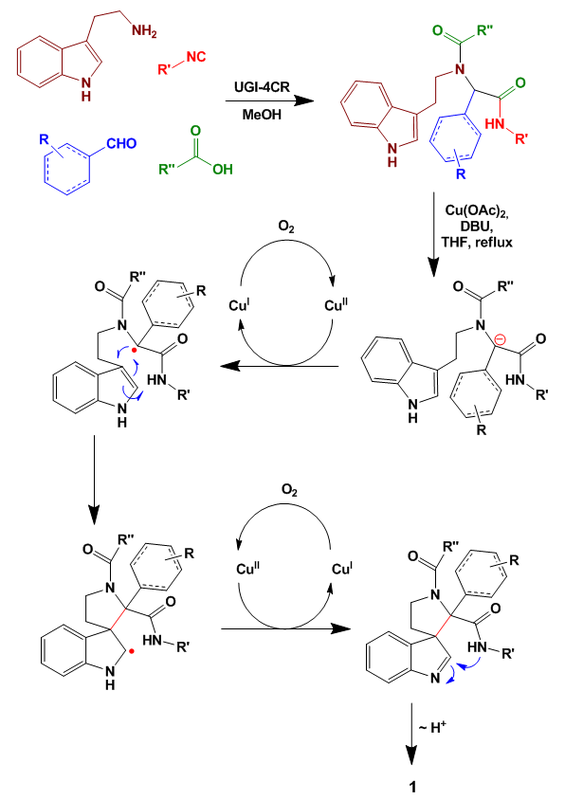 The core intermediate was prepared by an olefination/isomerization/Claisen rearrangement (OIC) and reductive cyclization (RC) of acetyl-indolinone. The synthesis starts with bromination of the ketone followed by SN2 displacement of the bromine by the chiral allylic alcohol shown. HWE reaction of the carbonyl function gives the expected olefin which isomerizes under the reaction conditions and gives directly after Claisen rearrangement the product shown. The stereochemistry is completely controlled by the allylic alcohol function and transposed into the quaternary carbon centre. 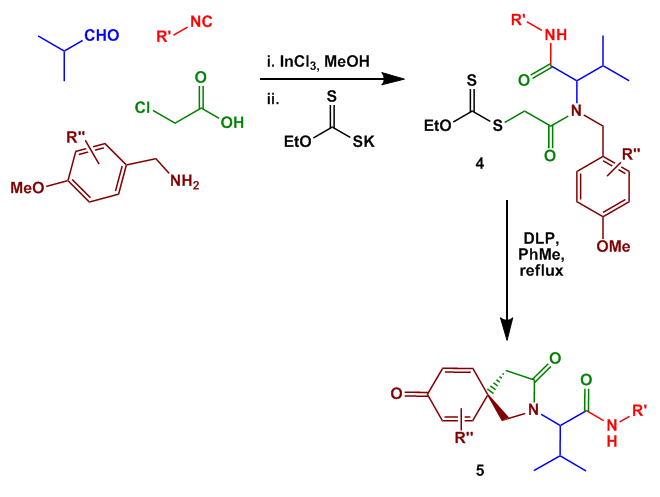 Ozonolysis and methenylation of the resulting aldehyde was followed by reductive amination with the amine formed in situ with lithium aluminium hydride. 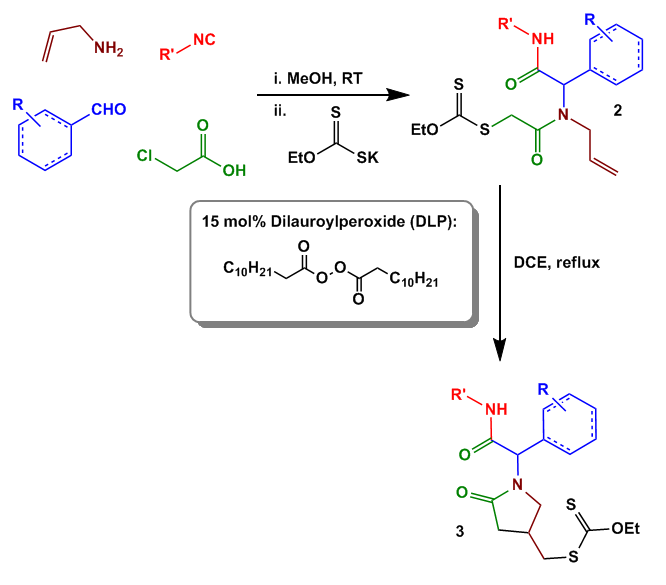 Since the acetyl protective group got lost under the HWE conditions it has to be reinstalled by Boc protection of the pyrrolo nitrogen, acetylation of the dihydroindole and Boc cleavage. After introduction of the imine double bond with TPAP the key intermediate was accessible in multigram quantities. 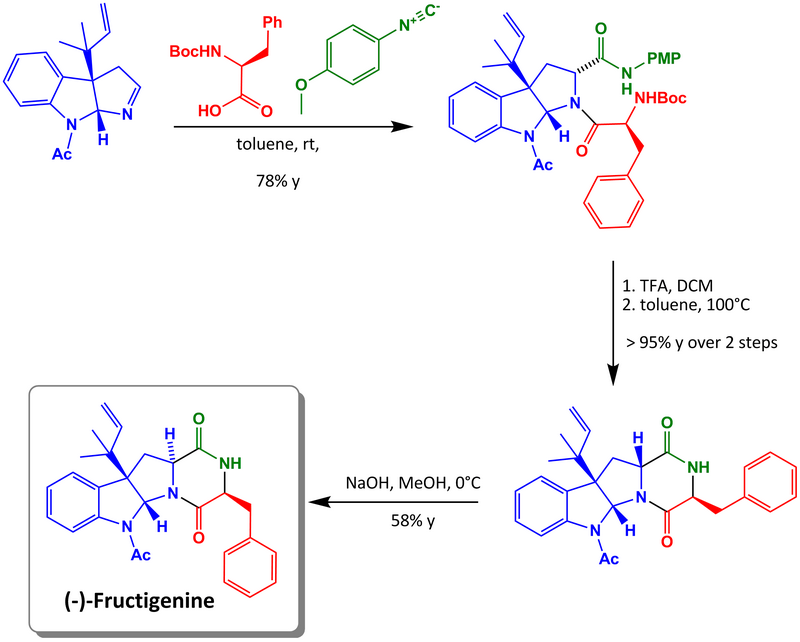 Fructigenine was formed by stereocontrolled U3CR reaction of the key intermediate with Boc-phenylalanine and PMB-isocyanide in toluene in high yield. The Boc group was removed with TFA and the piperazine closed in refluxing toluene. 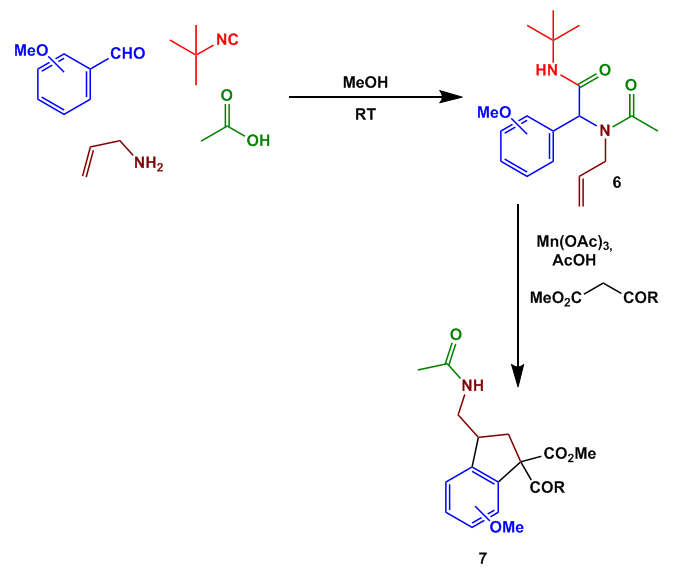 Isomerization with methanolic NaOH then furnished (-)-fructigenine without removing the acetyl group. 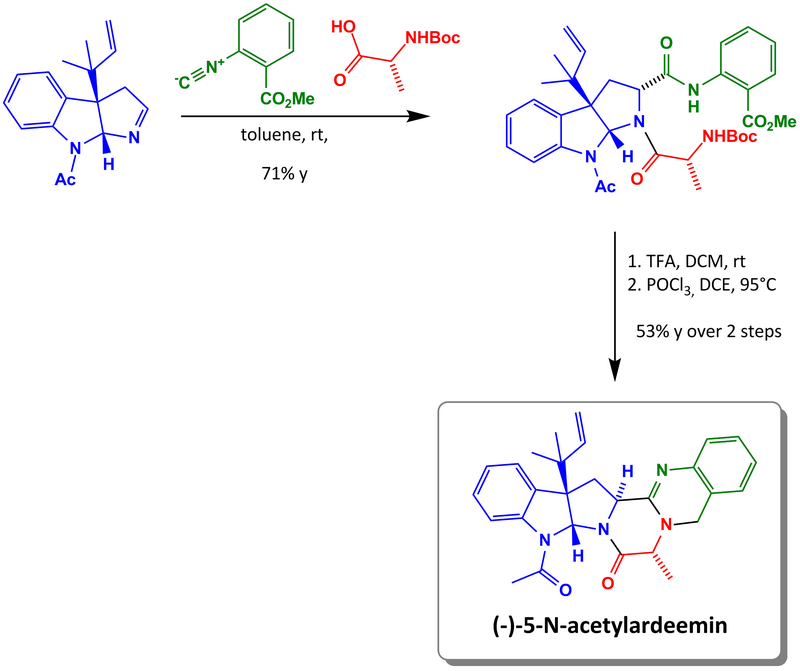 Acetylardeemin was formed in a similar manner by reaction of the key intermediate with Boc-alanine and methyl-2-isocyanobenzoate. 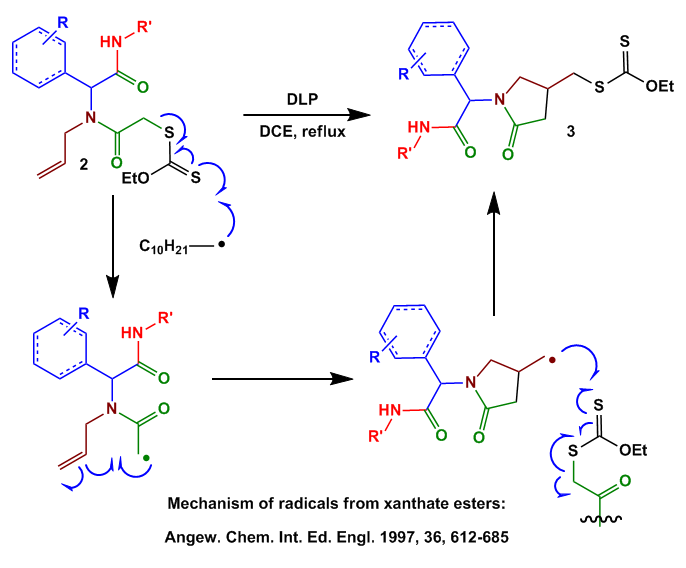 Boc removal was accomplished with TFA and the formation of the remaining lactam rings with POCl3 in refluxing DCE. 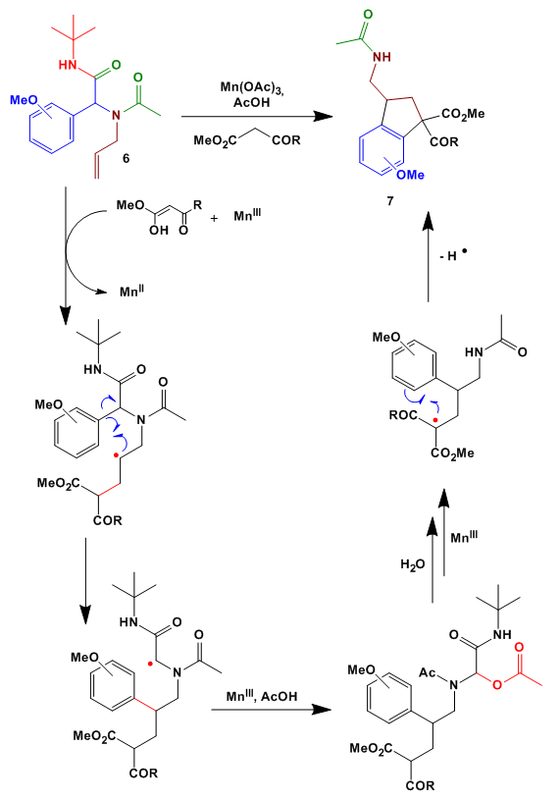 Nice syntheses. 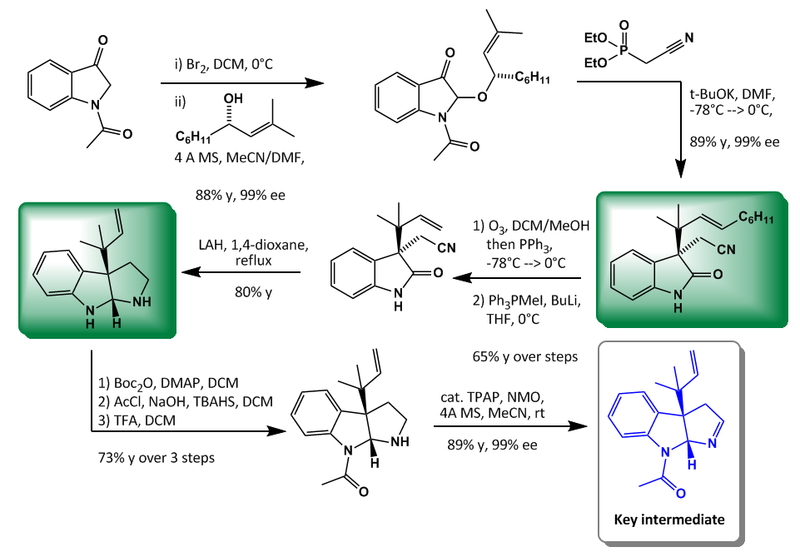 If the key intermediate would be easier accessible the products might have some potential in a HTS and a lot of compounds could easily be made for libraries.